In 2011, Citizen Matters, JP Nagar-Jayanagar-BTM print edition was just two years old, but well recognised by the residents of the neighbourhood. We covered critical issues of the area as well as provided a platform for residents to share their updates. I had reached out to Vinita who had an organic gardening blog, and asked her to write for Citizen Matters. She started writing about getting started with vegetable gardening and a blog chlorophyll-conversations based on her experiences. Through her, I met Dr Vishwanath (pioneer of Organic Terrace Gardening in Bangalore), Laxminarayan S and other enthusiastic kitchen gardeners, they were setting up a trust called Garden City Farmers Trust and were keen to spread knowledge of kitchen gardening; they proposed a community event on World Kitchen Garden day that is observed every year in August. I was all excited and Citizen Matters became the media partner. 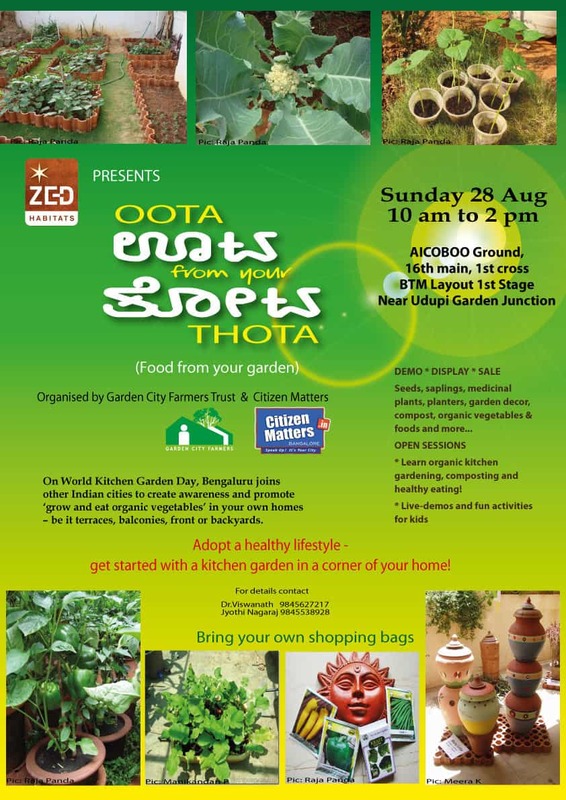 The first event named Oota from your Thota happened on August 28th at BTM Layout. We had interesting stalls from Daily Dump to BM English School whose students had come sell their organic produce! There were seeds, garden decor and accessories and open sessions on organic gardening and composting. Sangeeta Kadur held a sketching session for kids, and there were some pups ready for adoption, in the Let’s Live Together corner. Organic seeds, saplings, medicinal plants, compost and composters, potting mix, a variety of planters, organic food stuff, ready-to-eat delicious organic food, books & CDs, healthily jostled for space at Oota from your Thota! You can read more here. That morning, we were waiting for the visitors, wondering if people would bother at all. By the end of the day, we knew the event was a grand success, with around 600 people turning up and thoroughly enjoying themselves! Since then, it has been held across the city every quarter from Electronics City to Malleswaram to Whitefield. From those early days, it is amazing to see how the community has grown. There are over 32,000 members in the Facebook group of Organic Terrace Gardeners. 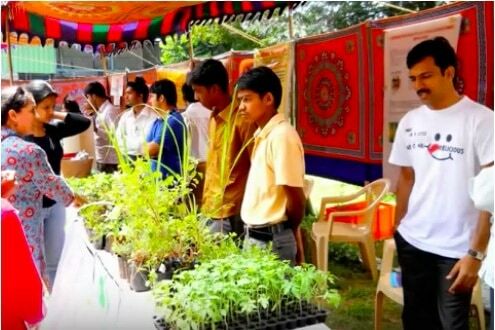 OFYT is now termed India’s biggest Organic Gardening Event. More power to such passionate citizens, thanks to whom the organic gardening movement is truly strong and thriving in Bengaluru and beyond.